We have two Seedy Sundays each year, in the spring and the autumn. 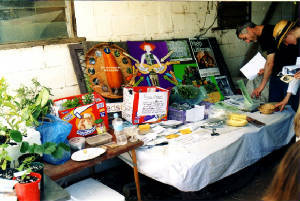 The photograph to the right is from our Autumn 2005 Seedy Sunday Seed Sharing table. Seedy Sundays usually consist of garden visits, seed sharing, seed saving workshops etc. The next Seedy Sunday will be on Sunday 6 April 2008. See "Seedy Sundays" in the left hand navigation bar for more details. As a way of "networking" with one another we have an emailing group, where people can post information about sharing excess seed, enquiry about availability of seed and about growing food/saving seed. SA Seed Savers emailing group - you can register to join here!